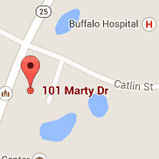 Learn more about our orthodontic office! 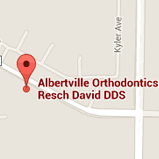 Welcome to Albertville Orthodontics and Buffalo Orthodontics, your friendly, family-oriented, board certified orthodontic specialist serving the Albertville, Buffalo, and St. Michael, MN communities. Everyone likes to have a healthy and beautiful smile. Orthodontic care by Dr. David Resch, a board-certified orthodontist, can help you achieve this goal. As our patient, you will receive highly personalized and professional attention by Dr. Resch to ensure you have a pleasant and rewarding experience at each visit. At Albertville and Buffalo Orthodontics, you can take advantage of the most advanced techniques available while relaxing in our comfortable office environment. In addition to traditional braces for children, teens, and adults, we also offer clear braces, Invisalign® clear aligners, Simpli5™ clear aligners, and SmartClip™ self-ligating braces. If you are interested in learning more about braces, or about your specific orthodontic needs, contact our Albertville or Buffalo office to schedule a complimentary initial evaluation!